Slow getting going this morning. Low tide was to be ~1:40. We stayed in bed late, had a beauty B-fast by Tom, we went walking, picked cattail and cooked up the roots. Fried 'em up in butter. Yum! Both of our first time having it. We left this farmer's field with a couple more roots and some sheep sorrel for later. So, here we are, camped on Suave Island, either in a nudist colony or on a wildlife refuge where camping is prohibited. Hard to tell from our map and the information - or misinformation - we were given earlier. Unfortunately, the man strolling down the beach during dinner somewhat confirmed the former. What a day! I woke up to the munching, snorting and shuffling of cows in our campsite. One overly curious cow knocked over the kitchen. Actually, I guess we were camped on their turf. 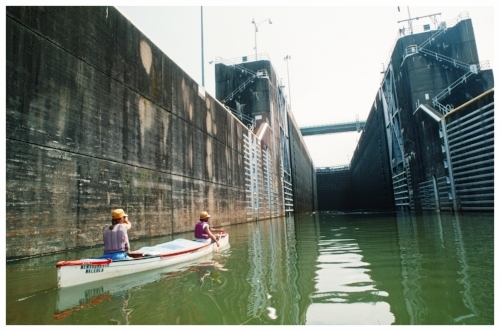 Entering Fort Louden lock on the Tennessee River - a similar experience to Bonneville lock & dam recounted in the following journal excerpt. Wind surfers like waves this size, canoeists not so much. Those winds we figure must gust up to 40 mph or more. They blew spray right off the water and created 3-foot waves. Not your typical canoeing sort of weather. So we sat after unloading and pulling the canoe up. We read, ate lunch and whiled away 2 hours until we thought we’d try it again. Just as we were putting the boat in, a gust came and knocked me around some. We bagged it. Tom held the boat out away from the rocks and I brought the packs. Total spray skirt time. Tom took the stern now and we headed out. The gusts would try to grab my paddle from me. We cruised! ... The point we wanted to get around splashed waves - I didn't want to try it. Nor did Tom. We just pulled up to the rocky embankment (that's all there was!) and unloaded. Tom held the boat - kept it from being beaten against the rocks the best he could while he took things out and tossed them to me on the rocks. How tense & intense! We decided to leave the canoe there by a big log for carrying it [all the way] up the embankment would have done it in. We locked and tied it out of reach of the crashing waves, took our gear up top and across from the RR and highway was a drive in dirt road to a beautiful waterfall. We took it. Vertical gate at John Day Lock and Dam on the Columbia River. What a trip across! It was real windy. The waves were all bow-licker size. Some hit 4.5 feet Tom estimated. These are our Tsunami waves. Our spray skirt helped us out a few times, still we took on a little water. We got across before the tug in plenty of time. A guy in a motorboat came up and asked if we were doing okay. We motioned we were fine and didn’t need help. It was nice of him to inquire. Good grief. All our efforts for naught. We finally found an okay place to pull up the boat, we sat on some driftwood and had lunch. The end of another wonderful day. What a nice campsite this is. Host extraordinaire Bill Stein signs our Thank You paddle after having providing us room and board in Pasco, WA. Bill lives here at the motel. We passed his room and he had a funny sign and a picture of himself on it. He’s really quite a character. He urged us…to go around the corner and look at another sign. It was a welcome sign for Tom and me. It had stick figures of Tom and me and funny quips about us paddling. It was a regular riot. Bill went all out. He insisted on taking not only our lunch check, but tonight’s dinner and breakfast tomorrow. He’s great!